“It enables project teams to be more active in their consideration of issues that ultimately care for the sustainability of our future. “I am also particularly pleased that this valuable assessment tool is now being rolled out to other councils to benefit from its use,” Mayor Townsend added. On 17 September MAG&M (Manly Art Gallery and Museum )was awarded a Highly Commended by the NSW Office of Environment & Heritage and received a Blue Star Sustainability Award for Cultural Heritage for its preservation of Manly culture and for the recent artists’ workshop held in conjunction with the Saltwater exhibition of indigenous art. Winners of the Blue Star Sustainability Metro Awards announced! 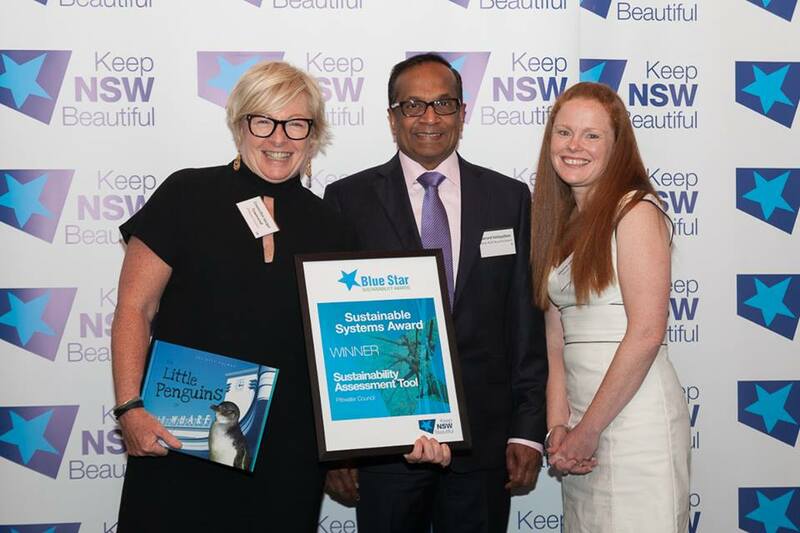 The first Keep NSW Beautiful Blue Star Sustainability (Metro) Awards were announced on Thursday 17th September 2015 at an elegant dinner at the International College of Management, Sydney in Manly. The dinner was hosted by writer, comic and Manly local Wendy Harmer, who regaled the crowd with jokes about motherhood, nature, Manly rivalries, and a good-natured ribbing of NSW Minister for Environment Mark Speakman. Wendy chatted with the award recipients, sharing facts and figures and inspirations with them, and with all of us – reminding us that change is possible, and that keeping our state beautiful is possible, if we just roll up our sleeves and get to work. The Blue Star Sustainability Awards have grown out of the iconic Sustainable Cities, Clean Beaches and Tidy Towns award programs. The Awards are designed to promote environmental sustainability, litter reduction, and community engagement, connection, and volunteering. The Blue Star Sustainability Awards have a 2015 approach to environmental sustainability and community health. 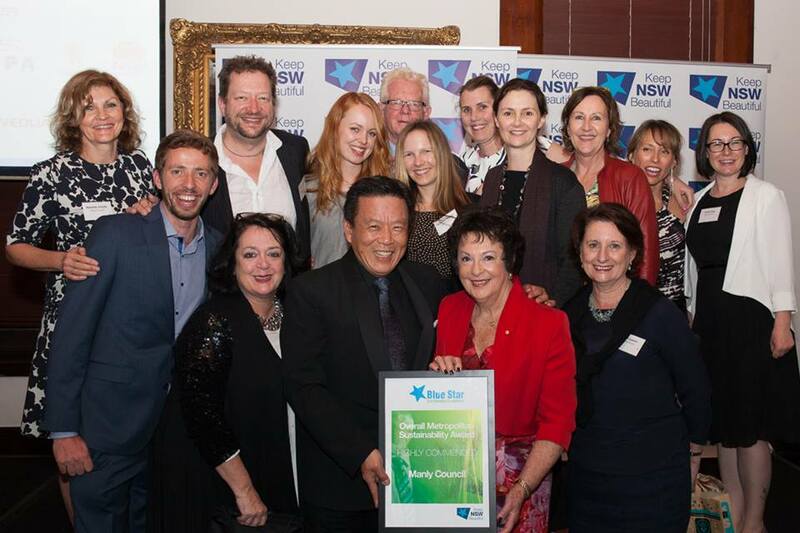 This year, in the first year of operation as the Blue Star Sustainability Awards, Keep NSW Beautiful has received a record number of entries – more than in any of the past seven years of awards. The biggest award of the night was the Overall Metropolitan Sustainability Award, which was awarded to the City of Canada Bay. The Council was lauded on the night for its environmental strategic plan that is committed to research, setting targets, evaluating outcomes and consulting with its residents at grass roots level. The City of Canada Bay was awarded a year’s free battery recycling program courtesy of MRI E-Cycle Solutions. They will now also go on to represent New South Wales in the Keep Australia Beautiful National Sustainable Cities Awards. 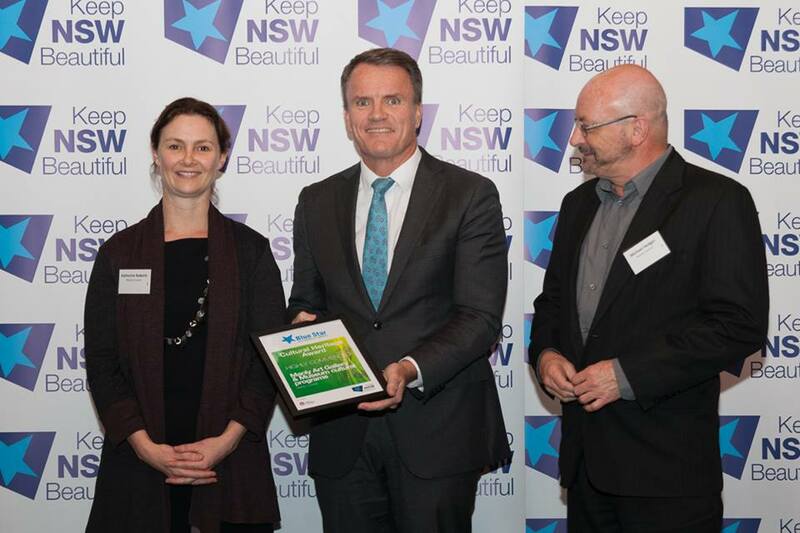 “I am so impressed with the quality of submissions into the first round of the KNSWB Blue Star Sustainability Awards,” said Keep NSW Beautiful Chief Executive, David Imrie. EnvironMENTALS Sustainability Group is comprised of representatives from the Science, TAS/CAPA, Teaching and Learning faculties, Campbelltown Council, parents and students. The group meets formally approximately twice a term to discuss strategies and create action plans to increase sustainability awareness across the school and in the community. During 2014 we participated in schools National Tree Day, National Recycling Week, came runner up in ABC Recycling Challenge and registered in the International Eco-Schools program. As part of our action plan a student group of between 6-12 students met weekly during 2014 to work on gardening or recycling projects. The students learnt to recognise weeds, work safely, use composting techniques and applied for grant money to help support their projects.